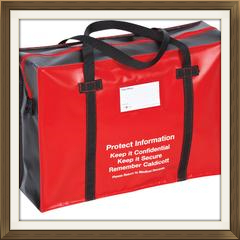 A range of heavy duty, reusable medical security bags & holdalls, some featuring carry handles, internal padding and clear label pocket. Suitable for a wide range of medical and pharmaceutical secure distribution applications. Combining a tamper evident zip lock, with either plain, colour coded or sequentially numbered security seals, there are three types available from stock as below. Protect patient confidentiality and adhere to Caldicott report. Item # MEDREC1=508mm x 356mm x 152mm £19.00 ea excl VAT and carriage. Featuring high density padding and carry handles for the safe and secure transport of controlled drugs. 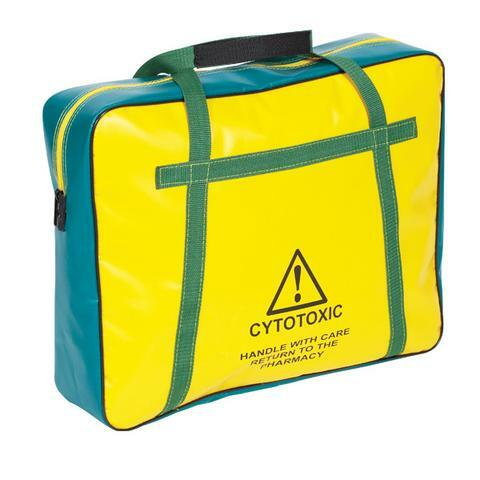 Item # CYT1=460mm x 360mm x 102mm £37.00 ea excl VAT and carriage. 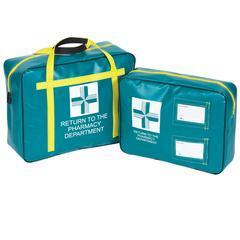 Clearly marked 'Pharmacy Dept' these padded bags are ideal for the secure transportation of pharmacy products. Available as a holdall with carry handles or pouch. Holdall Item # PH1=460mm x 360mm x 150mm £39.75 ea excl VAT and carriage. Pouch Item # PH2=410mm x 310mm x 100mm £39.75 ea excl VAT and carriage.